I highly recommend this system — very easy to use, great search engine, lots of flexibility. PDXpert PLM software provides a simple, flexible and scalable solution to the difficult challenge of managing your product's parts & bills of materials. PDXpert's engineering BOM accurately defines currently-approved parts, their vendor sources, and the documentation necessary for part creation and procurement. 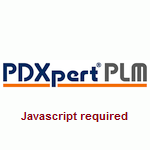 Unlike ERP/MRP bills of materials, PDXpert software maintains a complete history of previous BOM revisions, as well as describes planned changes and manages part/BOM review and approval. PDXpert software simplifies the creation and management of parts and their approved vendor sources, as well as how these are used on engineering bills of materials. All part properties — auto-numbering with description, unit of measure, attached design files, approved suppliers, and complete release history — are represented as a single object. This part object and its properties can be opened, viewed, assigned to BOMs, contain its own BOM, revised, copied and marked up to show how it's evolved over time. Each part can have its own list of approved vendor sources. These sources can be ranked, and can in turn have their own properties such as units of measure, cost and file attachments (such as vendor drawing, datasheet or specification). Quickly create new bills of materials with drag-and-drop ease. These are full-featured multi-level indented BOMs, and will calculate cost, mass and RoHS material roll-ups on demand. Complete product structures — BOM, files, approved sources, custom attributes — can be exported to other systems and to supply chain partners. If you're currently struggling with the limitations of using Excel spreadsheets for your BOMs, or have considered creating your own BOM database, you'll be pleased to learn that PDXpert software is actually simpler to use while being far more cost-effective.